Gemina court’s two-bedroom apartment brims with character in its modern simplicity. It provides an intimate and cosy setting. The sitting area opens up with leather seats, a flat screen TV on one end with a shelf where you can also keep your favourite books or a special souvenir. Wide windows bring in just the right amount of lighting to the room. The dining area-which holds a table for four, is in close proximity to the sitting place to create a closer feel where you can enjoy your meals while catching up on a show, perhaps. There is enough space where you can walk around the table and enjoy the views outside. Apart from the outdoor lighting, there are modern-design artificial lightings present on the sides of the wall and ceiling that help brighten up both the sitting and dining areas creating a spectacular ambience. The hallway stretches out to lead you to the rest of the apartment’s rooms which have ceramic tiles. The kitchen is uniquely designed with marble top counters which make them easier to clean, under them are brown wooden drawers where you can put a few plates and cutlery inside, there are also cabinets and shelves at a higher point on one side of the wall, keeping them out of reach of children, the shelves allow for easy storage and access of condiments and seasonings as you prepare a meal. Kitchenware is available at your disposal and you can even hire a chef to come make your meals for you. 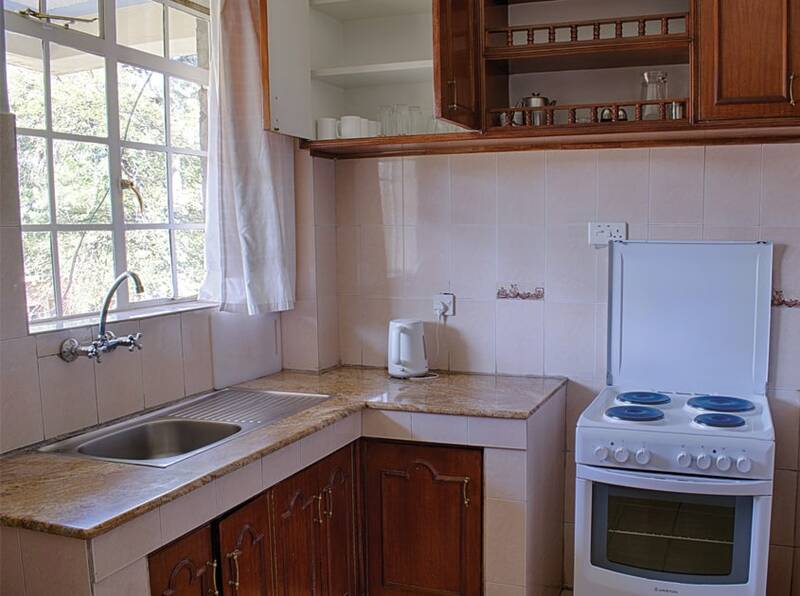 An electric water heater, microwave and four-burner gas cooker and fridge are also included. The ceramic tiles on the floor make it easier to clean as spillages are experienced a lot in the kitchen area. There is an en-suite master bedroom with a double bed and two bed-side tables, a vanity table attached to a built-in spacious closet enough for two people. There is a sleeping net, ironing board and iron box available to our clients as well. The wide windows provide natural lighting thus brightening up the room and it also makes its way to the bathroom where there is a shower section, a shower curtain, a modern toilet and towel shelf and hanger. 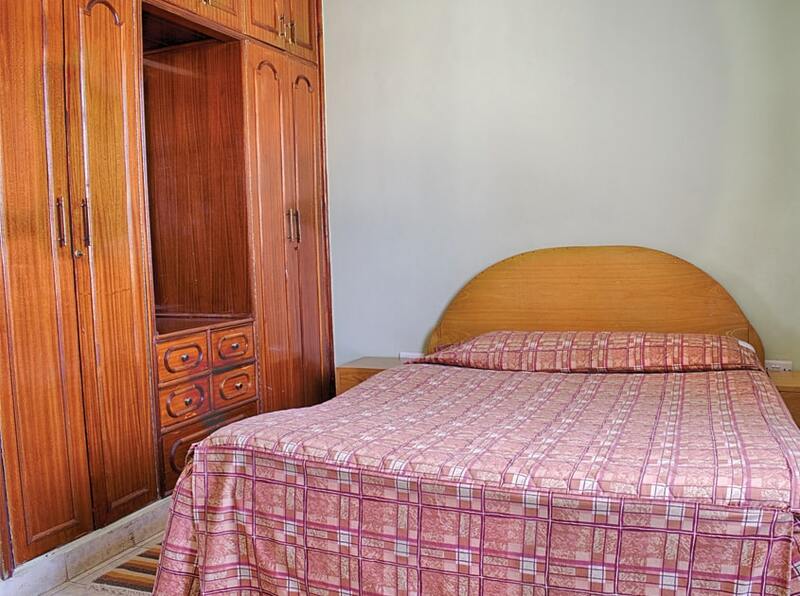 The second bedroom has a double bed, bed-side tables, a built-in closet with a vanity table and drawers at the bottom. 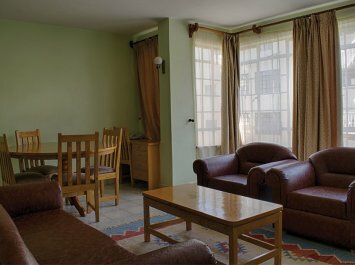 It is a spacious room as well and a sleeping net is also provided. The shared bathroom has a shower and shower curtain for privacy, built-in mirror and a towel shelf. There is also a hot shower option for both bathrooms that the guest can opt for while taking a shower, a waste bin and laundry basket. 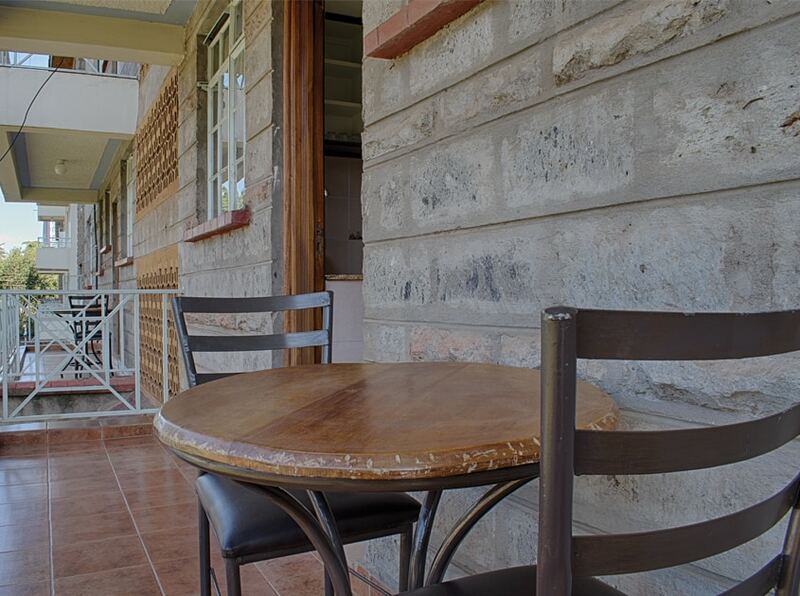 A balcony is present, giving our guests the perfect spot to unwind and eat out or have a glass of their favourite drink in the calm Nairobi weather and take in the surrounding views. Some patio furniture has been set out to relax, and be at ease. The maximum capacity for the two-bedroom apartment is four people.